Welcome to Metal Roofing DE! Metal Roofing DE is the leading Delaware installer of standing seam metal roofs and Decra stone coated steel roofs. Metal roofs are not just for commercial applications anymore, as they are one of the fastest growing segments of residential home improvement. A new metal roof is also perfectly combined with building integrated solar panels, making your home eligible for not only the 2010 $1500 tax credit, but also solar renewable energy credits! Standing seam metal roofing is ideal for all types of homes as it’s energy-efficient, durable and unique! 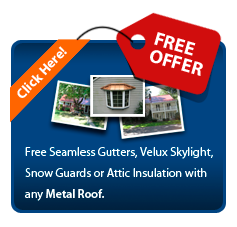 Find out how you can benefit from this cool roof today. © 2019 MetalRoofingDe.com is owned and operated by Global Home Improvement. All Rights Reserved. This site is listed in Metal Roofing Contractors directory.